Students will be encouraged to paint a number of different landscapes/seascapes creatively using photographs from around the Oregon Coast. Learn to use fundamentals of design by cropping images and simplifying objects. Katia will guide students through basic palette color choices and how to mix colors using simple color theory. 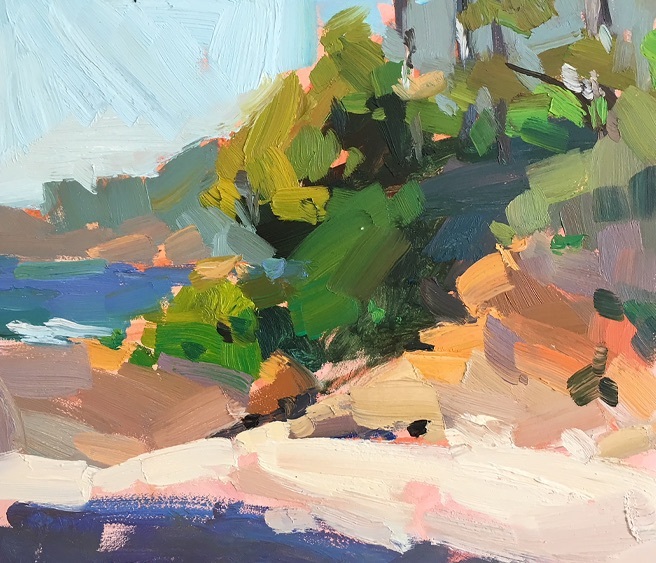 She will offer individual instruction to each student, covering the fundamentals of painting (composition, values, color), as well as advice on handling the medium (brushstrokes, edges). Students will learn the essentials of oil painting and become comfortable with solvents, oil mediums, brushes and oil paints. Katia is a Russian born, award-winning oil painter. She has lived on the Oregon Coast since 2008. She paints mostly from life, plein air or in her studio in Lincoln City. She exhibits at Rowboat Gallery and Volta Gallery. In addition to her painting and teaching, she is busy raising a child. series 6500 flats or brights, sizes 2-8.